In landscapes with well-spaced plantings like this one, point source drip irrigation is the most efficient solution. Landscapes with a full planting of flowers are a great candidate for drip irrigation laid out in a grid. 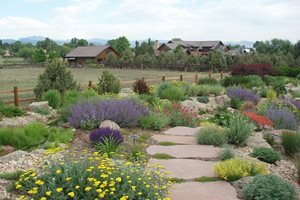 You may wonder whether installing an irrigation system for a low-water use xeriscape is necessary. It's a reasonable question! However, professional landscapers agree that installing a drip irrigation system is a must in 90% of landscapes. A successful xeriscape relies on thorough, regular watering during the first two summers to train roots to grow deep into the cool earth. Inconsistent watering can stunt this growth and leave plants reliant on you for years to come. Read on to learn more about the different irrigation options used in xeriscaping. 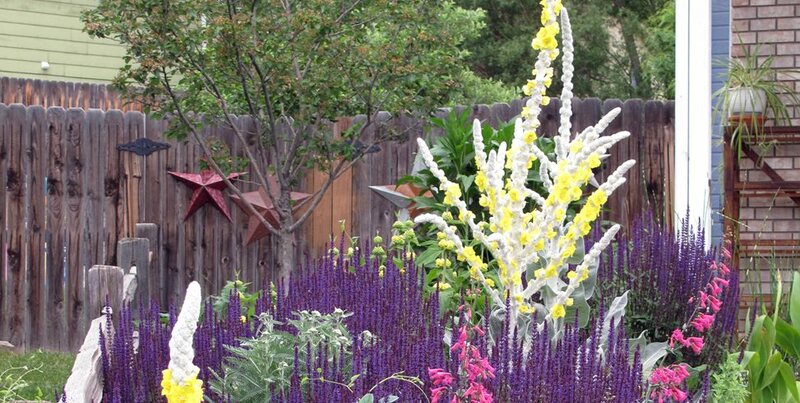 can be an effective option for retirees or those who work from home, but should only be used in a landscape with exceptionally drought tolerant plants. are a wasteful style of irrigation in a xeriscape, where the sheer quantity of water almost always results in runoff. is the traditional method of using drip, where each individual plant is given one or two emitters right at the base. is a newer method of using drip which provides full ground coverage over the entire planting bed. encourages winter rainfall to flow to a low point in the landscape where carefully-chosen plants can use it. Each of these methods has benefits and drawbacks, and the best choice for your project depends on a variety of factors including the specific plants in the landscape, soil type, climate, and your schedule. Hand wateringIf you've spoken with your landscaper clearly about your desire for not just a low-water landscape, but a no-water landscape, you may be one of the few people who can get away with hand watering. 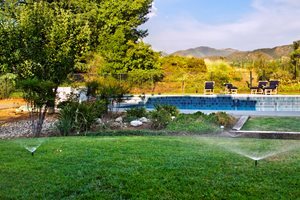 While your landscape will still need deep, regular watering during the first two summers to become established, after that point you may be able to get away with watering as little as once per month. When hand watering, aim to water the soil rather than the foliage, use an easy shut off valve on your hose end so you can control the flow, try to water first thing in the morning so plants can benefit all day, and remember that deep, infrequent watering is better than frequent, shallow sprinkles. Sprinkler systemsIf you have a small patch of lawn, you may end up needing a sprinkler system to water just that section. However, most xeric plants resent having their foliage watered by an overhead sprinkler. In addition, a sprinkler system puts out a great deal of water over a short period of time. This can result in waste and runoff when the soil can't soak up a large quantity of water in a short period of time. That's why the slow, steady trickle of a drip irrigation system is a far superior choice for xeriscaping. Even if you have lawn, you can consider using Netafim or another brand of drip irrigation laid out in a grid underneath the lawn. Using drip irrigation to water a lawn is a relatively new technique, but a highly effective way of reducing your water usage. Drip irrigation on an automated timerThis is by far the best way of watering your new xeriscape, because it gives just the right amount of water at exactly the right times. A drip system is made up of a series of flexible tubes which run along the surface of the soil. Emitters are placed at periodic intervals which dribble a slow stream of water over an extended period of time such as an hour. Tubing and emitters are laid on top of the soil, but are covered with a thick layer of mulch, which hides the tubing, holds in moisture, and reduces weeds. Almost every type of rainwater harvesting system, barrel, or tank can be hooked up to a drip irrigation system so your harvested rainwater is used first, before relying on the city's water supply. There are also rain sensors which can be used with your automated timer to adjust the amount of water given based on the moisture in the air. This is a great option if you travel a lot and may not be home to adjust the system yourself. Point source drip irrigation is the traditional method where each individual plant has its own emitter (or two) which is set at the base of the plant. This is ideal in landscapes where plants are spaced far apart, because you only water the areas that need it. However, this type of irrigation needs to be updated periodically to account for the fact that as plants grow, their root systems are no longer located at the base of their trunk. Drip irrigation on a grid is a new style of irrigation which is gaining in popularity. With this method, special tubing is used which contains in-line emitters spaced every 12 inches, and it's set up in a grid pattern so that every square foot of your garden bed is watered. The advantage is that you won't need to update your irrigation system as plants grow, because you already have even coverage. Plus, if you would like to add plants later, you won't need to fuss with adding extra emitters. However, this setup is best in landscapes where full ground coverage is desired, since it makes no sense to water the entire soil surface if your plants are spaced 6 feet apart. Drip irrigation on a grid can also be used to water small patches of lawn, which is a water-saving strategy because you don't lose any water to evaporation or runoff. Grading the soil carefullyIn desert landscapes, landscapers use the contours of the land to guide naturally-occurring moisture to where it's most needed, usually to trees and shrubs with deeper roots. While grading and contouring can be an attractive design element if desired, the ground doesn't need to be visibly sloped in order for water to flow. In damp climates, the same strategy can be used to create rain gardens, areas of the landscape planted with moisture-loving native plants which benefit from the seasonal rains. The yearly influx of water encourages these plants to grow deep root systems, which can then survive a dry summer with little supplemental water. While thoughtful contouring and grading won't eliminate the need for an irrigation system, it's a wise way of taking advantage of seasonal moisture. How much water is needed?The amount of water needed will depend entirely on your plant selection, soil type, and climate. However, there's a rule of thumb that can guide you in watering your plants: it's better to water deeply and infrequently, rather than give plants a frequent shallow spray. Deep watering encourages plant roots to grow downwards into the soil rather than spreading right along the soil surface. The deeper roots go, the better they are able to take advantage of the natural coolness and moisture in the soil. Shallow roots, on the other hand, bake in the sunshine and cause the plant to rely on you for regular doses of water. 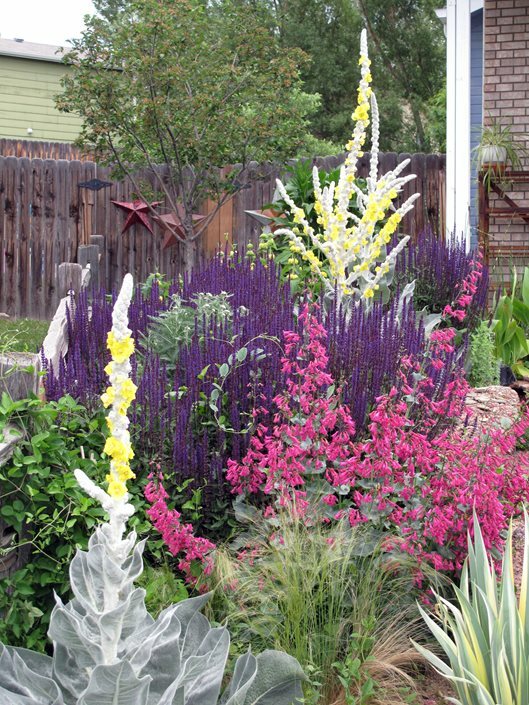 Here's how often the pros recommend watering a xeriscape. "During the first two weeks, I water heavily every other day," says Greg Frugoli of Ecotones Landscapes in Cambria, CA. When plants are freshly planted, they are completely reliant on us to water them regularly. After the first two weeks, Frugoli recommends watering deeply twice a week for the first two summers. "Ultimately, the goal is to water once a week, or once every two weeks," says Frugoli. 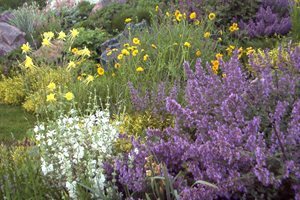 "In a setting with grasses, sages, and other plants that look good when they're a little bit rugged, you may be able to get away with watering only three times in the entire summer." As your garden grows, you'll develop a sense for how little water your plants can tolerate while still looking good. Many native and well-adapted plants can survive on very little water once established, but look more lush and colorful with regular water. You'll become familiar with your own plants' needs over time, and the question of how much to water will become an intuitive one to answer.